Discover Georges Michel (1763-1843) in the first exhibition devoted exclusively to the work of this French artist for fifty years. 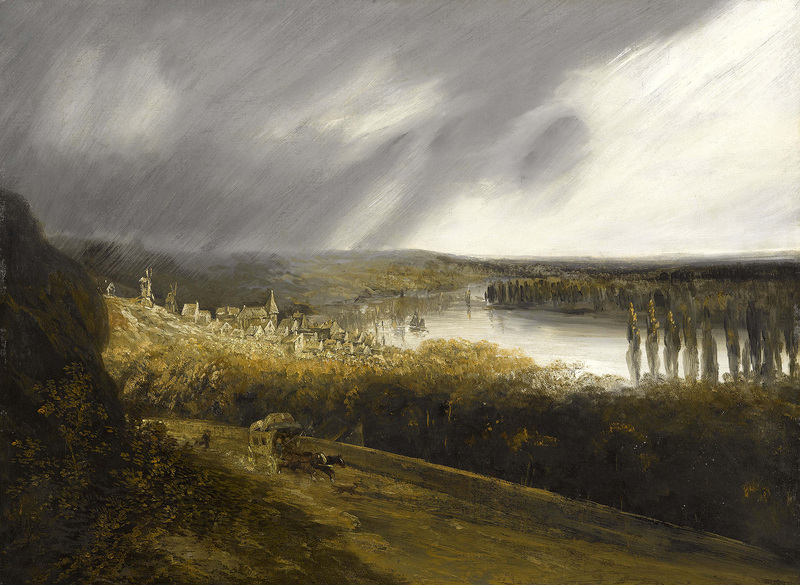 Admired by Vincent van Gogh, Georges Michel is held to be the precursor of plein air painting. 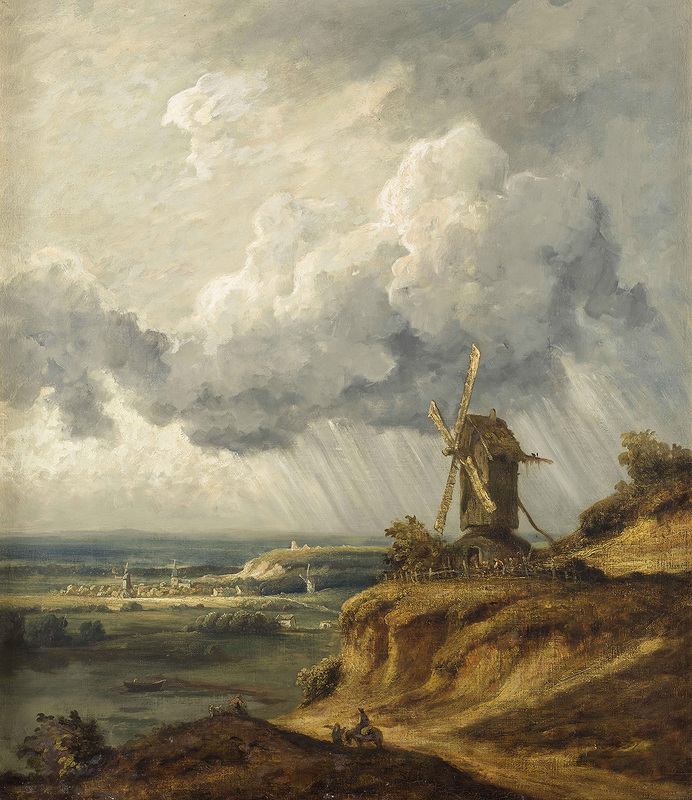 He was influenced by the painters of the Dutch Golden Age, earning the nickname of ‘the Ruisdael of Montmartre’. Yet today he is not widely known. The Fondation Custodia, in collaboration with the Monastère royal de Brou, is proposing to unveil the artist whose merits were first remarked by the dealer Paul Durand-Rueil in the nineteenth century. The first one-man exhibition for fifty years of the work of Georges Michel will be held from 27 January to 29 April 2018 at 121 rue de Lille, Paris. About fifty paintings and forty drawings – on loan mainly from French private and public collections – will be on show, and the exhibition will include some recent acquisitions by the Fondation Custodia. Georges Michel was born in Paris in 1763 and died there in 1843 after a remarkable career, whether in real terms or in a mythical post-mortem reconstruction of the life of this allegedly misunderstood artist. The main body of what we know about him comes from the biography written by Alfred Sensier in 1873, compiled from information recounted to him by the artist’s widow. Michel kept his distance from official art circles and only took part in the Salon between 1791 – the date when the exhibition first opened its doors to artists who were not members of the former Académie royale – and 1814. His name was not mentioned thereafter until the sale of his work and the contents of his studio a year before his death. The exhibition at the Fondation Custodia opens with youthful work by the artist, still betraying the influence of the eighteenth-century French landscape tradition as embodied in the art of Lazare Bruandet (1755-1804) or Jean-Louis Demaine (1752-1829), with whom Michel explored the Ile-de-France in search of subjects for sketching. 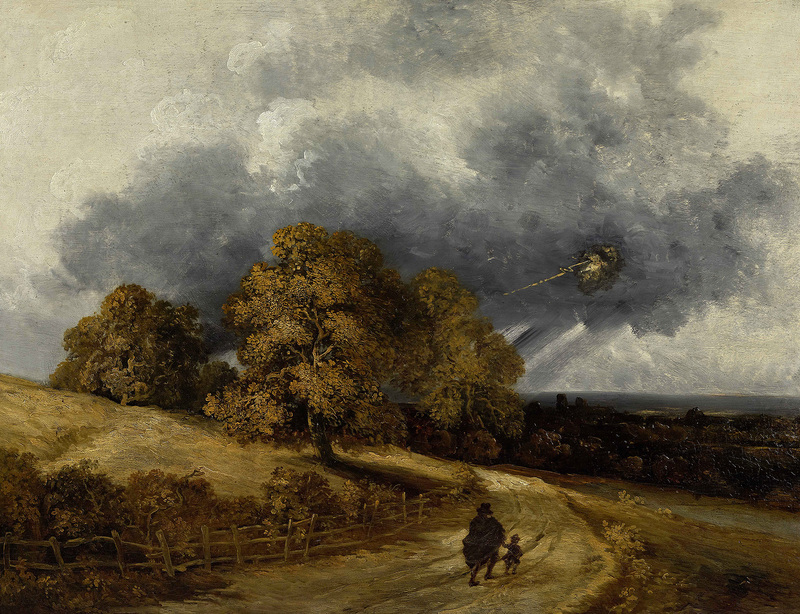 He remained loyal to Paris and the surrounding countryside, claiming that ‘anyone unable to spend a lifetime painting within a range of four leagues is just a blundering fool searching for a mandrake – he will find only a void’. Saint-Denis, Montmartre or La Chapelle, the Buttes-Chaumont and the banks of the Seine, the countryside to the north of Paris offered a variety of hills and plains, dotted with quarries, mills and scattered dwellings. Georges Michel’s style developed gradually away from the picturesque, anecdotic landscape that was in vogue between 1770 and 1830, achieving a notable originality. His paintings capture, with sincerity and a hint of the romanticism to come, the rural spots threatened with extinction as the villages around Paris began to be subsumed into the capital during the 1860s. At a period when the painting of the Northern schools was enjoying a revival in France, Georges Michel, according to his widow, carried out some restoration work on Dutch paintings for the influential Paris dealer Jean-Baptiste Pierre Le Brun (1748-1813) and for the Muséum central des Arts (now the Musée du Louvre), at the behest of its director, Dominique Vivant Denon (1747-1825). Even though no trace of this activity can be found in the archives, Michel’s work is incontrovertibly influenced by the masters of the Dutch Golden Age. The exhibition at the Fondation Custodia – one of whose aims is to study the reception of Dutch art in France – takes this opportunity to compare Michel with the predecessors he so admired – and whose work he sometimes copied. 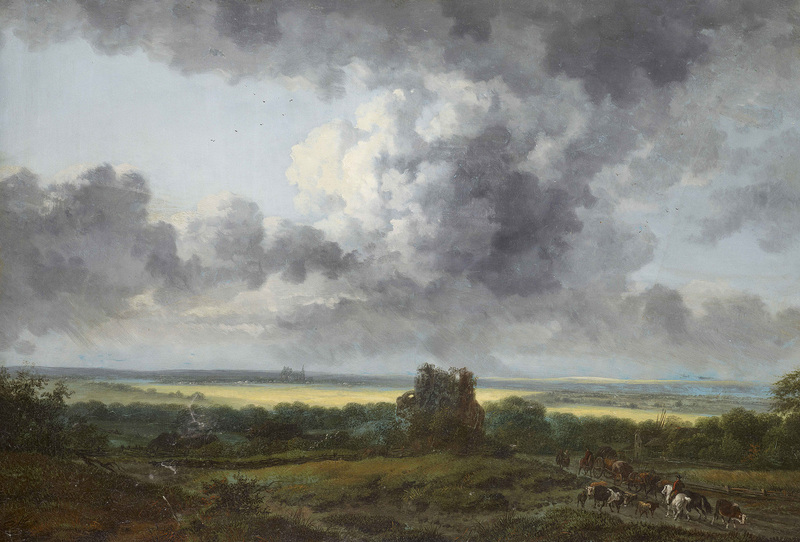 From Jacob van Ruisdael (1628/1629-1682) he borrows compositions enlivened by vast, windswept skies, with sometimes a shaft of brilliant sunlight breaking through the clouds. The masterly chiaroscuro in his paintings, however, has its source in the work of Rembrandt (1606-1669). 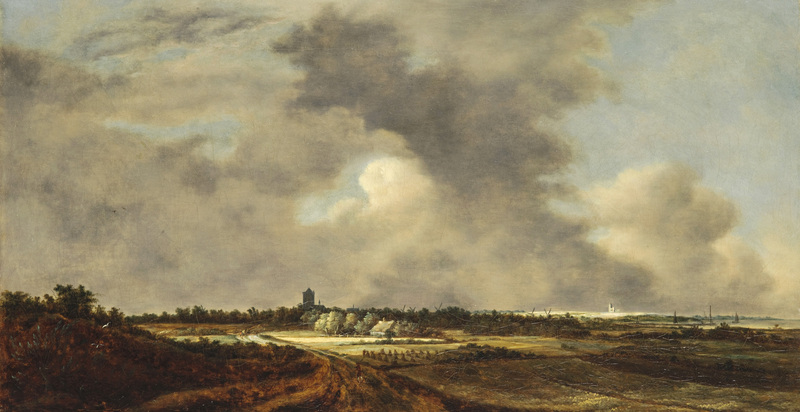 Philips Koninck (1619-1688), whose work in the eighteenth century was sometimes confused with that of Rembrandt, also evidently inspired Michel with his vast landscapes and limitless skies. The Fondation Custodia, a home for art on paper in Paris, has recently acquired a large number of sheets by Georges Michel. The last section of the exhibition is devoted to these drawings. Michel’s prolific graphic work is characterised by its wide variety of techniques and subjects. The artist excelled in capturing vibrant views of Paris – in black chalk or, less frequently, pen and ink. The topographical nature of these drawings makes identification of the chosen locations simple: the Louvre, the Tuileries, the Jardin des Plantes, the Barrières de Ledoux. The lack of confidence to be glimpsed at times in these urban scenes is amply compensated by Michel’s skill at recreating the atmosphere of rural landscapes. 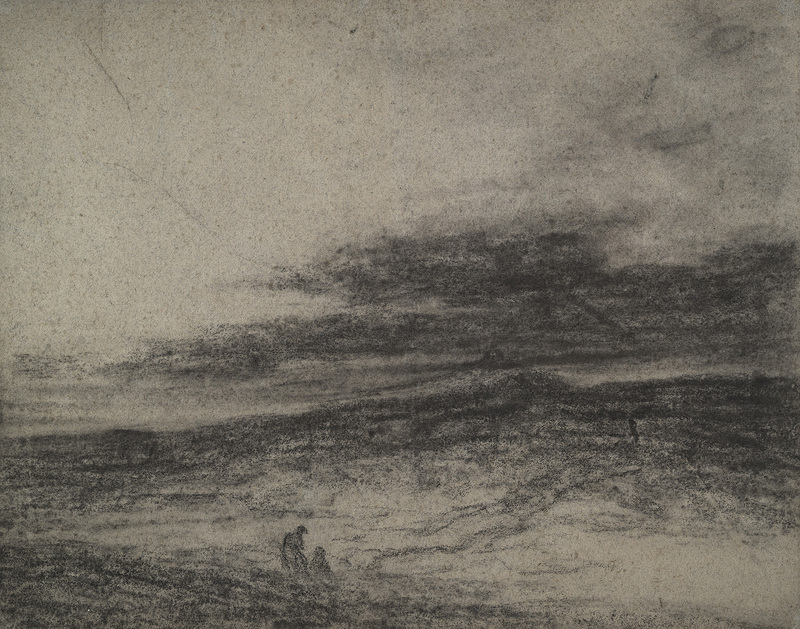 As he tramped the still-fallow plains of the Ile-de-France, Georges Michel produced a considerable number of open-air studies in black chalk alone, often on blue paper of a standard size. As in the paintings, the wide plains dotted with fleeting points of interest are reproduced on small pages, sometimes collected into albums, four of which are still to be found in the Louvre, the Musée Carnavalet and the Rijksmuseum in Amsterdam. Taken from a fifth album acquired by the Fondation Custodia in 2016, a selection of fifteen studies in this exhibition illustrates the artist’s habit of compulsive, almost obsessional, sketching. They bear witness also to Michel’s need to endlessly rework his chosen subjects, simply in order to explore their possibilities. 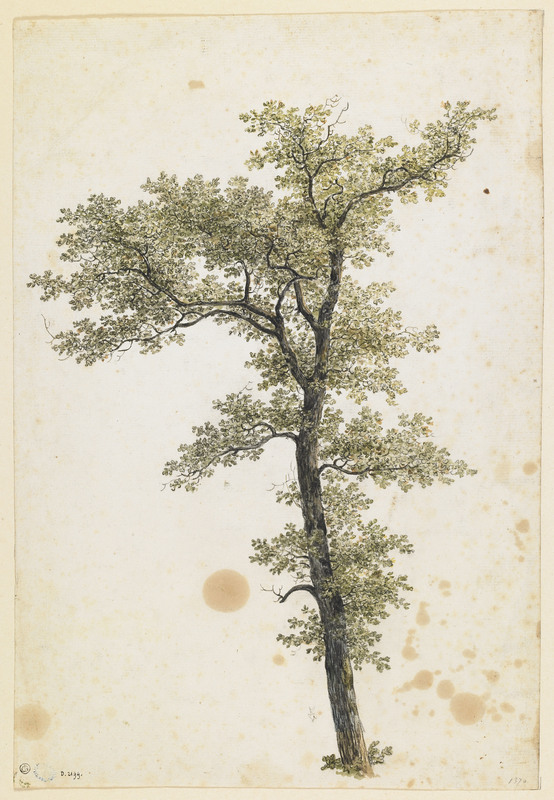 His drawings of isolated objects are less common; probably the most striking of these are his studies of trees. Heightened with water colour and sometimes annotated, these drawings are the fruit of very exact observation – indeed, they have something in common with genuine botanical studies. Georges Michel’s interest is primarily in the majesty of a particular specimen or the extraordinary forms taken by another; they pay homage to nature’s picturesque qualities and the variety of her creations. Black chalk, brown wash and watercolour. 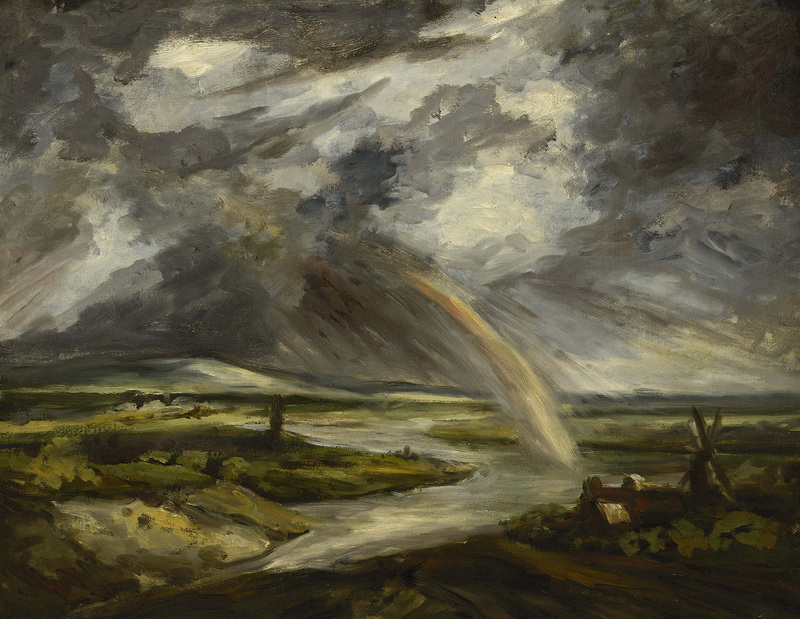 Although influenced by French predecessors and by the art of seventeenth-century Dutch artists, Georges Michel’s work is possessed of a wholly individual vibrancy and turbulence. The freedom of the brushstrokes in his paintings – comparable to the dramatic use of black chalk or charcoal in some of his drawings – allows him to transcend the Ile-de-France. Michel’s landscapes are based on observation but far outstrip it; the results are truly sublime. 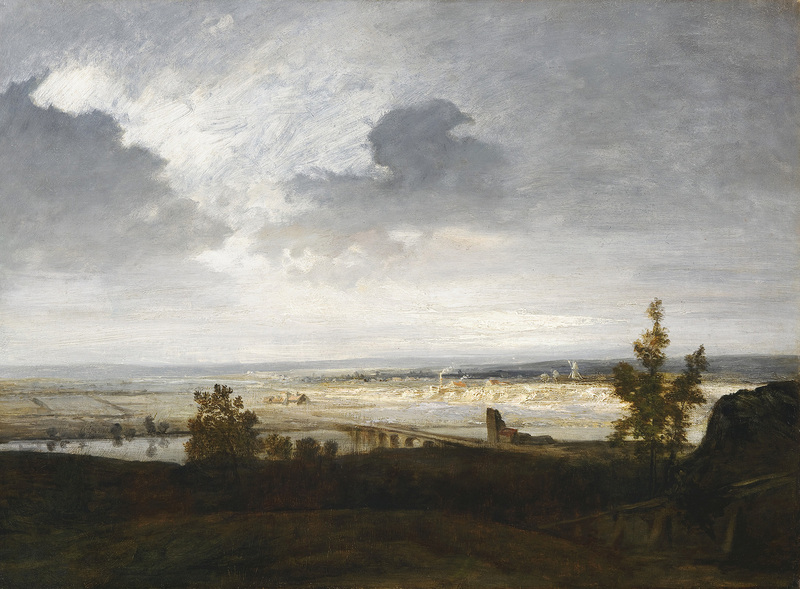 The work of Georges Michel marks a turning point in landscape painting in France. He influenced the generation of painters led by Jules Dupré (1811-1889) and Charles Jacque (1813-1894), but he also made a deep impression on Vincent van Gogh (1853-1890). Van Gogh’s letters reveal his familiarity with, and his admiration for, Michel’s work and his personality – he calls him ‘maître Michel’ (master Michel). 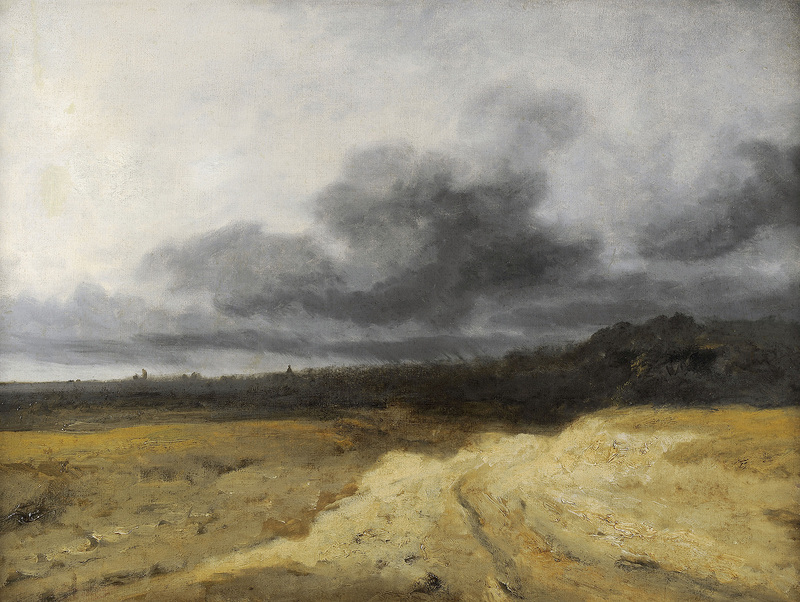 Within the collection of the Fondation Custodia, Georges Michel perfectly embodies the link between the landscapes of the Dutch Golden Age and the oil sketches, painted out of doors, of the artists of the nineteenth century. This exhibition is organised by the Fondation Custodia in collaboration with the Monastère royal de Brou, Bourg-en-Bresse. Curators: Ger Luijten, director of the Fondation Custodia and Magali Briat-Philippe, conservateur, responsable du service des patrimoines, Monastère royal de Brou. 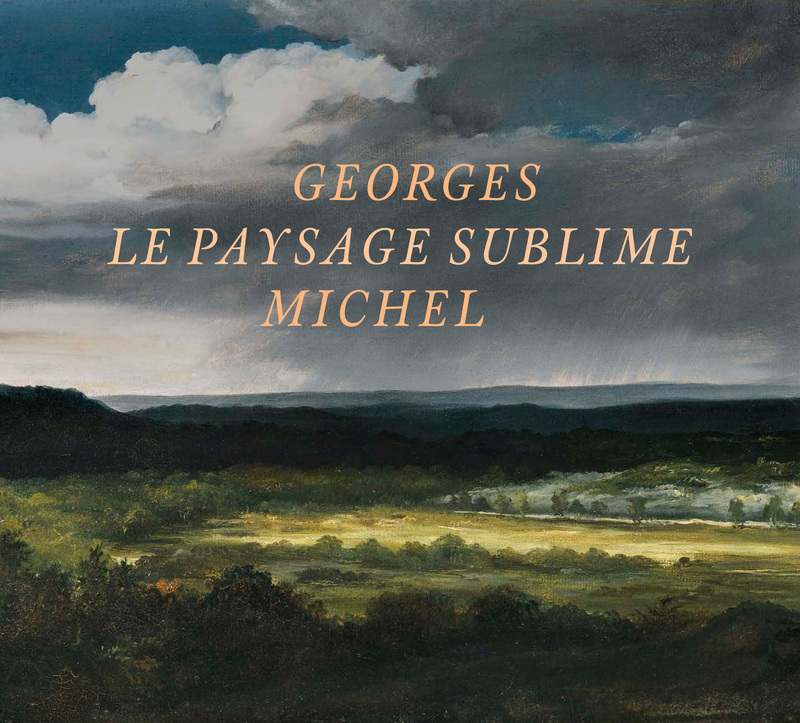 Possibility to visit the exhibition Georges Michel. Le paysage sublime with a conference guide on the following dates (in French): Wednesday 28 February at 12 pm (fully booked), Saturday 17 March at 12 pm (fully booked), Tuesday 27 March at 12 pm (fully booked), Saturday 7 April at 12 pm (fully booked), Saturday 14 April at 12 pm (fully booked).